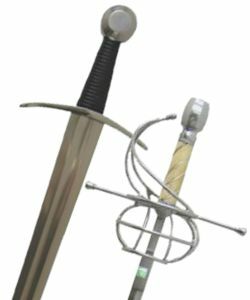 The sword has gained much popularity in the past couple decades and for the first time in centuries there are several specialized forges offering a wide selection of properly produced hand forged swords, ready for you to enjoy. Once you have decided which martial arts form you would prefer to learn, it will require much training and patience if your aim is to become a master. Not unlike , other martial arts forms, there is no shortage of sword disciplines to choose from but you can quickly narrow the field by asking yourself is; would prefer eastern or western swordsmanship? There is no reason you can't learn from both but this is a good place to start. Western martial arts covers a variety of sword types ranging from the early roman gladius, The large two handed great swords carried by the fully armored knight. It even covers the much more graceful renaissance rapier. All of these disciplines differ greatly, so finding a starting point that you would enjoy most is the most important part because none are a prerequisite for the other. If you have only a curiosity and want to learn the basics that is alright too but if you are dedicated and want to truly learn any art form you should seek out a reputable school in your area. Many instructors of western martial arts have mastered their discipline from original manuscripts, sword and military training manuals from the medieval times. Translating them and developing them into a respected modern day martial art form. Eastern martial arts are practiced widely throughout the world. Many martial arts forms are available like tai chi, kung fu, iaito and tameshigiri to name only a few. Iaito and Tameshigiri involve mastering the draw of the katana and finally the cut. If your favorite swords are the katana then you may want to begin your search there. Wherever you choose to start your learning, you will certainly enjoy and appreciate the journey to mastering the swords of the east. Japan and China both have very well documented history involving the sword and if you were commuted enough to move and train there you could find generational martial arts schools passing down their knowledge from person to person as opposed to re-learning the art form from texts. Reliks has dedicated itself to the sword and can offer you the right piece and proper equipment for your chosen discipline. 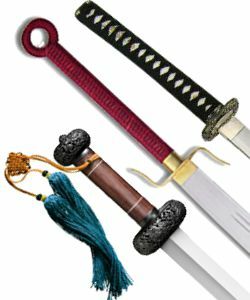 We can help you find the best swords to begin your journey all the way up to full sensai grade swords once you have gained experience. Proper equipment for your level of expertise is important even if you are not ready for a live sword. We can help you with a variety of wasters or boken to practice strikes or technique. Traditional trainers that are available in numerous materials, sizes, styles and weights. Our dedication to the sword is also a dedication to those that wield them and study them. Our dedication to this industry has us well known for not cutting corners (no pun intended) for the sake of making a sale. We are committed to finding the right sword for you so you will be successful in your study.